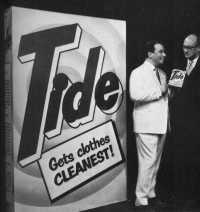 was for Gibbs S R Toothpaste and was transmitted at 8.12 pm on Sept 22 1955 during a variety show hosted by Jack Jackson. 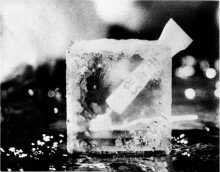 Viewers saw a tube of toothpaste embedded in a block of ice and a woman called Meg Smith brushing her teeth in the approved manner, "up and down and round the gums". The immaculate tones of Alex Macintosh delivered the newly-minted slogan: "It's tingling fresh. It's fresh as ice. It's Gibbs SR toothpaste." The commercial owed its prime placing to chance. The Gibbs advertisement had come first in a lottery drawn with 23 other advertisements, including those for Guinness, Surf, National Benzole, Brown & Polson Custard and Summer County Margarine. Click picture for video Murray Mints, Murray Mints, the too-good-to-hurry mints. Why make haste? When you can taste the hint of mint in Murray Mints (1955). Jingle was recorded by The Stargazers. 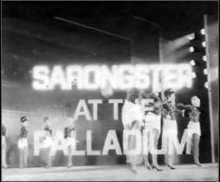 Cliff Adams and the Stargazers appeared on Sunday Night at the London Palladium about three months after the start of commercial television. They took a chance and ended their act on what they called their 'latest recording'. They came on in bearskins and re-enacted the commercial on the stage. Then they pulled off the bearskins and inside them they had packets of Murray Mints which they threw to the audience. It caused a sensation, and showed the power that commercials had, even within three months. Click picture for video You're never alone with a Strand (1959). This jingle was again written by Cliff Adams. 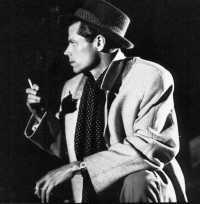 The actor was Terence Brooks who looked like Frank Sinatra, standing on a street in London, wearing a trench coat, with a hat on the back of his head, stopping to light a cigarette. 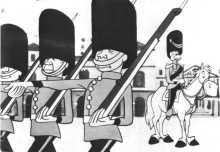 This was followed by the theme tune. As soon as the commercial went on the air, enquiries started coming in, people ringing up and asking if there was a record of the music available. So Cliff Adams quickly went to a studio and recorded "The Lonely Man Theme". The released record contained no vocals and nothing was mentioned about cigarettes, just the musical theme. It is known that another version was recorded including some vocals but this was never released. Cover and sleeve of a promotional cardboard record disc supplied to shopkeepers. The other side has Jimmy Lloyd singing "You're Never Alone with a Strand"
So Johnny sat at his piano and played and sang these seven words - 'Rael-Brook Toplin, the shirt you don't iron'.... repeated three times and then again in a changed key. Harry was delighted and said 'That's what I want, don't change anything', and they never did! "Coates comes up from Somerset, where the cider apples grow.....!" 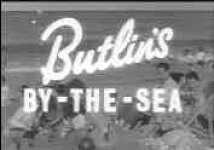 Click picture for video Butlins - still going strong today! 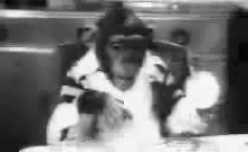 Click picture for video Brooke Bond PG Tips starred the Brooke Bond chimps (1956). The first of these adverts was set in an elegant country house and showed an immaculately dressed 'boy' and 'girl' sitting at a Regency table and drinking tea from a silver service in dainty china cups. 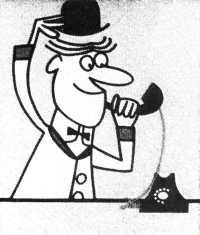 The voiceover came from Peter Sellers. Click picture for video "Never go without a Capstan"
Click picture for video Joe, the tongue-tied Esso Blue paraffin salesman who called himself the 'Esso Blee Dooler'. Joe was created in 1958 when paraffin was a relatively common household fuel, but its use steadily declined over the years, as did Joe. 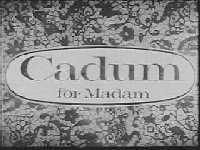 Cadum for Madam, toilet soap introduced into the UK by Colgate-Palmolive in 1955 from France where it had been an established brand since 1907. "Go to Work on an Egg!" When the British Egg Marketing Board launched the Go to Work on an Egg' ads, no-one could have anticipated just how famous they would become. Watch the ads and find out for yourself. The 1950s ads starred Tony Hancock, the legendary comedian, and the Go to work on an egg slogan is attributed to Fay Weldon, although she claims she was just the manager of the team who created the famous line. Tony Hancock is probably most famous for Hancock's Half Hour which kicked off in November 1954, becoming a British institution for almost two decades. 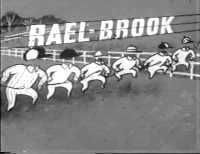 You can now see Hancock in action, along with Patricia Hayes and Pat Coombs - eight of the ads from the original Go to Work on an Egg campaign are available to watch. Click on the link above! 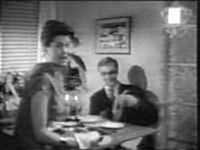 click picture for video OXO - Katie was launched as a TV advertising feature in October 1958, with the actress Mary Holland (at first on Sunday evening, in three sequential episodes). 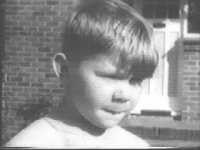 In 1960 a stouter husband replaced the willowy orginal. 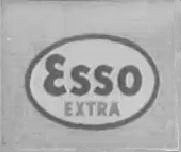 Call at the Esso sign, For Esso Extra! All the family love Carnation! Because Carnation makes even the simplest dishes taste wonderful, like this rice pudding made with one part double-rich Carnation to three parts water. Its extra creamy, and to pamper the palate, pour Carnation over the pudding too. Its delicious! 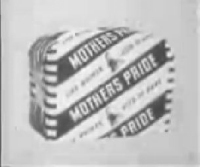 Click picture for video Mothers Pride is over 70 years old, first appearing in the north in 1936 and a national brand by 1956. Originally sold wrapped in wax paper, it progressed with technology to introduce the now-familiar plastic bread bag - although Mothers Pride Scottish Plain can still be bought in wax-wrapped bags. Click picture for video Ribena was advertised as the blackcurrant health drink. 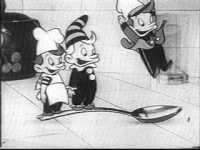 An animated cartoon. which would be very un-PC now. Click picture for video Get that Lovely, Lively, Lyril feeling! No action here, just a series of still images. It was the catchy line above which was memorable. 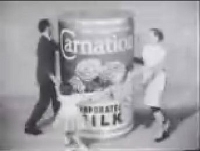 Click picture for video Dairy Box was a Rowntree brand. This Dairy Box ad features a dancing character called Judy. 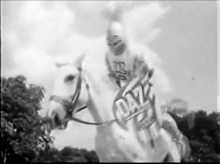 Click picture for video The Daz White Knights travelled around the country offering £5 and £10 prizes to those housewives who had stocked up with Daz washing powder. 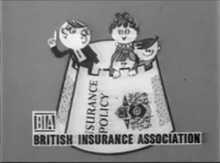 Click picture for video The British Insurance Association commercials featured Fred and his family. "Get the full strength of the insurance companies around you!" 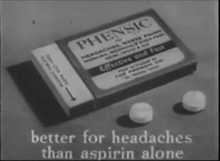 Click picture for video "Phensic is better for headaches than Aspirin alone"
Click picture for video It all began a long, long time ago when Rowntree opened a tea and coffee shop in York in 1725. 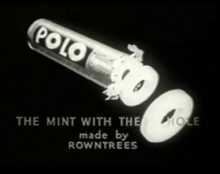 The Rowntree confectionery line gained popularity and in 1948 they launched the Polo Mint. It was similar to the Lifesavers that could be found in America and the British Navy Sweets but Rowntree attacked this problem with gusto and an aggressive marketing strategy and have since become known for their slogan and the shape of their mints, especially in the UK. 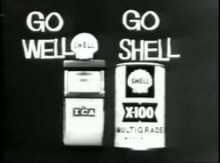 Click picture for video The roll call of commercials with straplines that have entered the common parlance is almost endless: 'Go to work on an egg'; 'Milk's gotta a lotta bottle'; and enjoy the freedom of your car - 'Go well, go Shell'. Click picture for video Which do you prefer? Margarine is said to be better for you, but butter is so delicious! 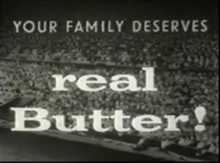 So it's a difficult choice to make: do we think about our health and pocketbook and eat margarine, or do we enjoy the guilty flavour of real butter? 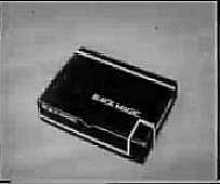 The first night of commercial television included these advertisements: Guinness, Surf, National Benzole,Brown & Polson custard, Lux, Summer County margarine, Batchelor's Peas and Brillo. Sooty promoted Oxo and we were told 'Don't say brown, say Hovis' and 'You'll wonder where the yellow went when you brush your teeth with Pepsodent'. In 1957 we were told that 'the Esso sign means happy motoring' and that Fairy Snow gives 'washday white without washday red' - a dig at powders which caused skin rashes. Norman Hackforth intoned, 'Ah, Woodbine - a great little cigarette'. Also featured was a new type of programme called an Admag of which 'Jim's Inn' was the first. 1958 introduced us to the long running Oxo series starring 'Katie' and 'Philip'. 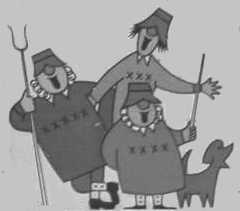 The first 'Katie' was Mary Holland and the first 'Philip' was Richard Clarke, followed by Peter Moynihan. Everything revolved around dinner as Katie informed Philip that Oxo has nine good ingredients and 'gives a meal man appeal'. Also in this year we were told by Bernard Miles that Mackeson 'looks good, tastes good and, by golly, it does you good'. Fry's Turkish Delight (jingle by Cliff Adams) showed a male slave unrolling a carpet containing a glamorous female captive in front of an Eastern ruler who began feeding him lumps of Turkish Delight which was said to be 'Full of Eastern promise'. 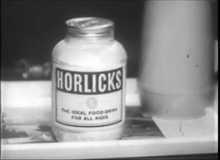 Why not take a trip down memory lane and look at some of the classic tv ads of the 1950's to the present day, click on any of the links to re-live some of those classic moments. The Advertising Archives - the largest and most comprehensive resource of its kind in Europe. Our collection comprises over 1 million catalogued images  50,000 of which are searchable online, including British TV stills dating from the very first transmitted advert to the latest campaigns.